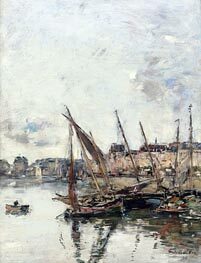 Eugene Boudin (July 12, 1824 - August 8, 1898) was one of the first French landscape painters to paint outdoors. 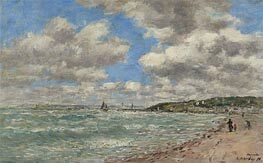 Born at Honfleur, Normandy, he worked in a small art shop where Claude Monet displayed his art work Le Havre and Honfleur across the estuary of the Seine. 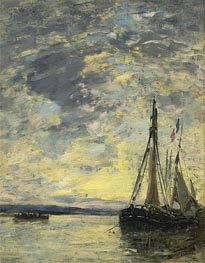 But before old age came on him, Boudin's father abandoned seafaring, and his son gave it up too, having no real vocation for it, though he preserved to his last days much of a sailor's character, frankness, accessibility, and open-heartedness. 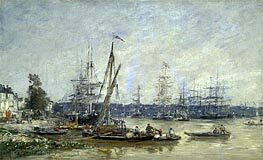 In 1835 his family moved to Le Havre, where his father established himself as stationer and frame-maker. 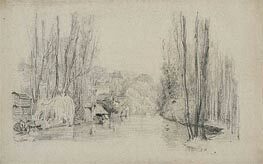 He began work the next year as an assistant in a stationery and framing store before opening his own small shop. 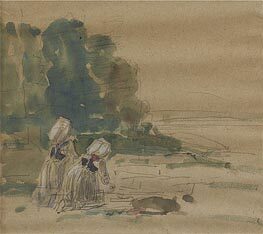 There he came into contact with artists working in the area and exhibited in his shop the paintings of Constant Troyon and Jean-Francois Millet, who, along with Jean-Baptiste Isabey and Thomas Couture whom he met during this time, encouraged young Boudin to follow an artistic career. 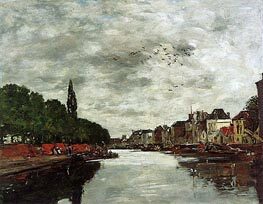 At the age of 22 he abandoned the world of commerce, started painting full-time, and traveled to Paris the following year and then through Flanders. 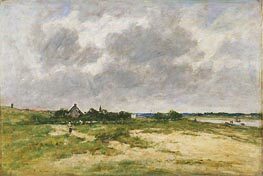 In 1850 he earned a scholarship that enabled him to move to Paris, although he often returned to paint in Normandy and, from 1855, made regular trips to Brittany. 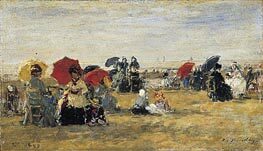 Dutch 17th century masters profoundly influenced him, and on meeting the Dutch painter Johan Jongkind, who already made his mark in French artistic circles, Boudin was advised by his new friend to paint outdoors (en plein air). 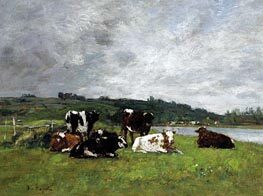 He also worked with Troyon and Isabey, and in 1859 met Gustave Courbet who introduced him to Charles Baudelaire, the first critic to draw Boudinâ€™s talents to public attention when the artist made his debut at the 1859 Paris Salon. 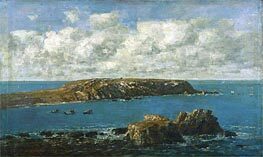 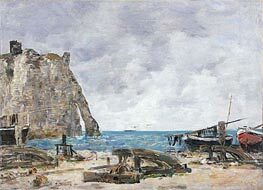 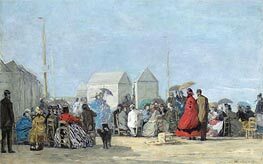 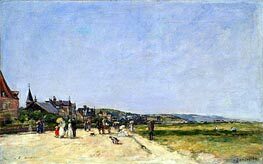 In 1857 Boudin met the young Claude Monet who spent several months working with Boudin in his studio. 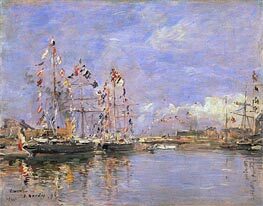 The two remained lifelong friends and Monet later paid tribute to Boudinâ€™s early influence. 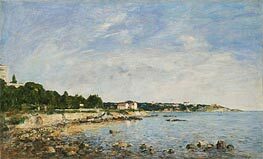 Boudin joined Monet and his young friends in the first Impressionist exhibition in 1874, but never considered himself a radical or innovator. 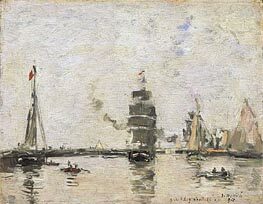 Boudin's growing reputation enabled him to travel extensively in the 1870s. 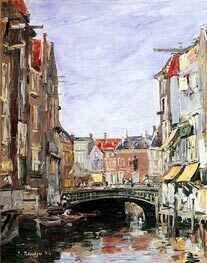 He visited Belgium, the Netherlands, and southern France, and from 1892 to 1895 made regular trips to Venice. 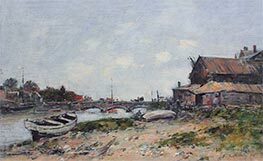 He continued to exhibit at the Paris Salons, receiving a third place medal at the Paris Salon of 1881, and a gold medal at the 1889 Exposition Universelle. 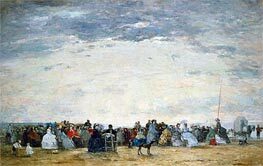 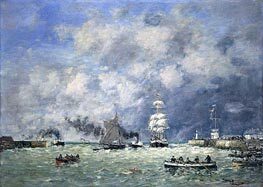 In 1892 Boudin was made a knight of the Legion d'honneur, a somewhat tardy recognition of his talents and influence on the art of his contemporaries.